Ultiworld’s 2019 Women’s College Awards are presented in part by VC Ultimate, a leading supporter of women in ultimate. They are also presented in part by the National Ultimate Training Camp, who can help prepare you to be an All-Star. All opinions are those of the authors. As the regular season comes into the home stretch, it’s time to see how the awards races are shaping up. It’s an interesting year in the women’s division. The Rookie of the Year race is bursting with contenders. The Player of the Year watchlist, by contrast, is shorter than years past because the top six to eight teams play deep. It’s not as easy to identify the top player on teams like UNC, Pittsburgh, or Carleton. Yet a few familiar names are still emerging from the pack; we break it down below. If the season ended today, Elimelech would win Player of the Year in a landslide. She’s been an unreal, unstoppable force all season long. She’s led her team to the first ever California triple crown, winning the Santa Barbara, Presidents’ Day, and Stanford Invites. Yes, ultimate is a team sport and UC San Diego has been a great team from top to bottom this year. But Elimelech has been the best, most influential player on the best team on the country. Her defense has been smothering. When Elimelech is on the field, it’s a no fly zone. If you stop watching for her for just moment you’re likely to miss a colossal layout block or impossible monster sky. A five tool player, she’s also been dominant as a goal scorer and a thrower, but it’s her defensive authority that really has her in this spot at the top of the midseason POTY list. She’s been the defining player of the season to this point, and frankly, the runners up have not been close. If the rest of the season plays out the way the first half has, then we’ll have the easiest Player of the Year choice we’ve had in quite some time. Without any hesitation, Dena Elimelech is the mid-season 2019 Player of the Year. Ever see those movie posters where the two tough leads stand side-by-side but the one actor is half a step further forward because they have top billing? That’s Dena Elimelech and Julia Kwasnick. Both are stars who could easily carry their own franchise, but have blessed us with a season where they have to share the spotlight to some extent. UCSD’s constant flattening of their competition in 2019 has skyrocketed Elimelech’s fame, but in a way, UCSB’s success is just as impressive. With their goonish defensive mentality, UCSB’s particular brand of ultimate is personified by Kwasnick –who’s been critical to furnishing the team into a national contender. It’d be wrong to call Kwasnick a standout defender. ‘Imposing’ doesn’t do her justice, either. When Kwasnick is locked in on a player, the space she occupies may as well be a dead zone. We often speak on how elite throwers open the entire field for their team, Kwasnick does the exact opposite when she’s on defense. Her excellent body awareness and split-second decision making denies has frustrated opponents all year. The fact that we can make a POTY case for Kwasnick based solely on her defense should speak volumes for her talent. Her offensive toolset is just the icing on the cake. It’s rare to see a full field huck in the women’s division, but Kwasnick is one of the few that can not only pull it off, but make it look effortless, too. Whether she’s positioned as a power-thrower or UCSB’s every-other downfield, Kwasnick’s presence cannot be denied. After the clear frontrunner, Elimelech, and standout Kwasnick, there hasn’t been another player who set themselves up with a strong first half of the season. There are very talented players who we expect to assert themselves. Given what we know and what we’ve seen, here are four players who could find themselves in the thick of the conversation come May. Verzuh’s name will be on this list until they walk across the stage at Dartmouth graduation. Verzuh’s game IQ and on-field leadership make them almost as dangerous as their height and their big bids; teams have to play box and one in order to take Verzuh out of the equation. If (when?) Dartmouth reaches the National final again, it will be due as much to Verzuh’s influence behind the scenes for Princess Layout as their influence on the field. Northwest Challenge will give us a final regular season glimpse at Verzuh’s dominance in the college division. Jezierski is a big part of why Ohio State has vaulted themselves into semifinals contention, and still their most dynamic playmaker. That’s never really been the issue. The highs for Jezierski are POTY-level. And while her defense is stronger and her patience a little more noticeable, she still struggles with toeing the line between aggressiveness and carelessness, both with the disc and when defending. Like Verzuh, this is probably dependent on Dartmouth winning Nationals again. But Trop is absolutely capable of exploding at Northwest Challenge and in the series and leading the team to a third straight national championship. Don’t forget that it was Trop who led the team in +/- at Nationals a season ago, posting a staggering 20 goals, 17 assists, 19 D’s, and just 12 turnovers. Verzuh obviously takes a lot of attention from opposing defenses, and that can free up their Dartmouth teammates to put up the crazy numbers. If Trop exceeds her freshman performance and Dartmouth completes the three-peat, she could easily be the 2019 Player of the Year. The Rookie of the Year race is wide open. The class of 2023 delivered on the preseason hype and have made picking finalists an impossible mission. As we couldn’t narrow the list down this early in the season, we’ve provided a ‘shortlist’ of rookies that all stand a chance of sweeping us away by the end of this season. Whether it’s instinctual or built over years of honing her craft, Rippe has an understanding of defense that few of her peers can match. 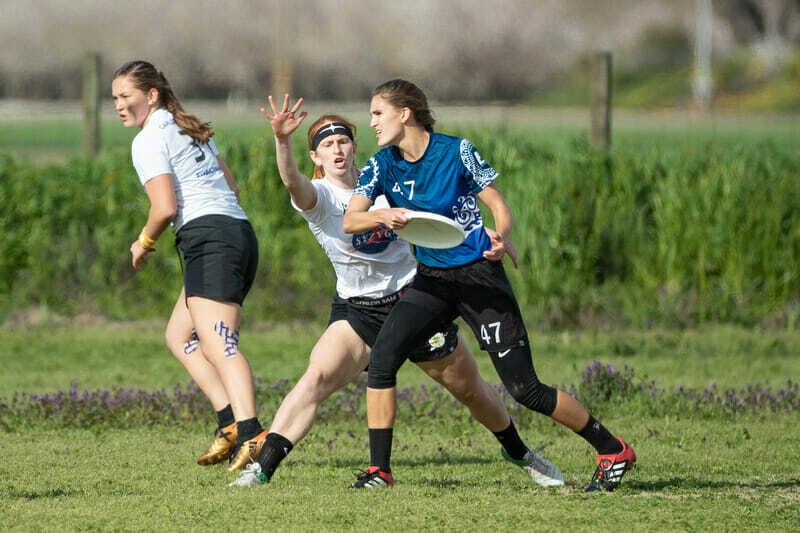 Her blend of refined positioning and brute athleticism is the type of talent that the Nerdlucks would steal for ultimate’s version of Space Jam. Her skillset involves both the speed to outpace nimble cutters and the physicality to outbid larger opponents. Her role on UNC has grown in leaps and bounds this year, and the trust shown by her teammates is a testament to Rippe’s on-field ability. UNC has been dealt an unfairly good hand this season, Rippe might just be the trump card. She has the highlights to prove it, too. Watch Sims play if you want to read a textbook on defense. Sims’ quick footwork and smart sense of spacing keep her in her matchup’s pocket and ready for poach blocks or help defense. Sims loves to play physical, competitive defense against opponents, and her matchup with Julia Kwasnick in the Stanford Invite semifinal was the beginning of a beautiful defensive rivalry. Sims’ style marries the science of fundamentals with the art of big, gutsy plays. Colorado Kali has seen a massive shift in their team after making the finals at Nationals in 2018. The team has managed to remain competitive thanks to good coaching, team chemistry, and fierce intensity–but also because of Emma Capra. Kali is visibly different when she’s on the field. While she’s been doing it all for Kali on offense and defense, her talent shines through when asked to shut down the best player on an opposing team. Coaches have called it ‘gifted’ and opponents have called it ‘frustrating’. No matter the term, Capra affinity for game-altering blocks has fueled her team all season. Cast aside any doubt that Colorado was in for a rebuilding year this season. As the leader of Colorado’s defense, Capra’s been taking down the best players in the college division –and her season’s not close to being over. It’s common for a college player to return better after a season at the club level. What’s uncommon is just how much better Audrey Brown has been this year for UCSB. She’s equally effective on the field with or without the disc, a rare trait in college players. For Wildfire, Brown was primarily a defensive specialist. On UCSB, everything about her game is special. She shifts between roles as a handler and cutter role on a dime, transitioning from a position as the primary thrower to an initiating cutter without difficulty. That’s not to say that Brown looks effortless on the field. Every cut, throw, and layout looks like she’s putting her entire essence into making the play. Her 5’0″ frame packs a massive punch when necessary, which is often enough for a team that like to take shots. Perhaps most importantly of all, Brown has shown she knows how take the right shot, not the first one. She feasts off her team’s energy without letting it will her into poor turnovers. What Brown has isn’t just lightning in a bottle, it’s the full storm. When Emily Barrett steps onto the field, it’s the equivalent of OSU bringing a tank to a fistfight. As OSU’s most formidable downfield threat, Barrett has shown time and again that she alone is enough to jumpstart Fever’s offense. Barrett’s prowess has always been well-known; she just now seems to realize that she can be the best player on the field at any given point. In a team filled with some of the biggest stars in college ultimate, Barrett has crafted a name of her own through uncompromising work ethic. No defender has an edge over Barrett when she’s setting up her cuts. By choosing her spots and using her body to shape her path to the disc, the OSU handlers can throw it to Barrett with abandon, knowing she’s going to have the best play on it. Efficiency rarely gets the praise it deserves at the college level. It’s much easier to tell when a player makes an enormous bid than when they make every correct move to get open or shift their mark to get off the perfect pass. If there’s anyone that can make efficiency look flashy, it’s Anne Worth. When tracking Worth highlights, you first have to follow her for the entire point to see exactly how masterfully she set herself up for the perfect play. Appreciating Worth’s game is admiring the brushstrokes that went into a Van Gogh. The final product is impressive, but doubly so when you understand the detail that went into it. In multiple games this season, Worth has made the exact same deep cut to easily collect a disc, only to repeat it a few points later with equal amounts of success. There’s nothing more discouraging as a defender than being beat the same way twice. Perhaps even more discouraging is that there was really no way for them to prevent it. That’s just how Worth plays. Comments on "2019 D-I Women’s College Awards: Midseason Shortlists"